To make room for Ronald Belisario’s return from suspension, the Dodgers have designated reliever Mike MacDougal for assignment. MacDougal, whose time as a Dodger has appeared to be running out for a week or two, was guaranteed $1 million this year, including a buyout of his 2013 option. If he clears waivers, he could end up pitching in Albuquerque and possibly return later this season, though there’s no promise of that happening. In 2012, MacDougal, 35, had allowed five runs and 15 baserunners in 5 2/3 innings with four strikeouts. Belisario last pitched for the Dodgers in 2010. Following a 2.04 ERA and 8.2 K/9 in 2009, Belisario slid to 5.04 and 6.2 in ’10. It’ll be interesting to see if he can get back on the beam, but I’m not sure how long he’ll have to prove himself. I feel a little bad for Mac but it’s all on him, he pitched poorly and while last year he was okay, that was a little deceptive. This year was no deceiving. Still, a team like the Angels could be tempted. Ol’ McDougal has an arm, just can’t get the ball over the plate. Can’t say that I will miss his always exciting appearances. I was really expecting that comment to turn into a nursery song. Put something together, but feeling a litle sheepish. Best of luck to him wherever he lands. with a ball four here and a ball four there…? Coffey has an ERA of 18 right now and isn’t getting paid much either. I expect he’s on a pretty short leash as well. Scotty, other than the fact that he has a left arm, would also seem to be in a precarious situation. Even as a LOOGY he has an OPS against of 1.159. So Eric Stephen says there are only 39 players on the roster still, is this because Belisario was already on the 40 man? And if so does this mean that MacDougal didn’t need to be DFA’d (subjective I know) quite yet? Just wondering if there is a second announcement coming soon, like the signing of Abreu. Thanks. Stephen eventually answered me, while also calling me mentally challenged. Class act. I’m sure Jon wouldn’t appreciate me getting into it here but I must say my first question was pretty straight forward and I didn’t become sarcastic until his first reply which was pretty rude in my opinion. Oh well, one less Dodger blog to follow. I’m going to have to take a wait and see for now. Based on what I saw in the spring and on rehab, this is currently a push. Long term upside, of course, favors Belisario. Just notived this on Yahoo! Jonathan Broxton gets the save against the Yankees tonight. Oh, and Mariano Rivera is done with a torn ACL. Time to save up for Orioles playoff tickets. Pretty sure that Camden Yards has already been booked for monster tractor-pull in early October. Its a fifteen year tradition. Not sad to see him go tbh…. hope he gets his stuff straight with another team… now next order of business, DFA Kennedy and add Abreu NAO!!!!!!!!!!!!!!!!!!!!!!!! Jon, the other day i was wondering about Alfredo Silverio. How’s he doing? anything new to report on his recovery? Boy, we are a pretty tough crowd around here when it comes to the last 2 or 3 spots on the roster. Is there a proper way for an athlete’s career to end? Going out in a blaze of glory winning a championship with some dramatic play at the end is pretty rare. If Rivera had started pitching poorly, wouldn’t people have just begged him to retire? It’s unfortunate he got injured, but the game doesn’t often give a player a choice on when to quit. It’d be sad but he’s had such an amazing run, years and years of both great success and great health. Most relievers have a shelf life of 2-3 years. So I feel for him, but I don’t think this should override the run of both talent and luck that he’s had nor will I get out my violin for Yankee fans. I always thought that Grover Cleveland Alexander set the emotional standard for leaving the game, but then I found out that “The Winning Team” played a little loose with the facts. But, still. May 6 game goes from KCAL to PRIME TICKET. May 7 contest at Dodger Stadium goes to KCAL 9 from PRIME TICKET. Mariano. one of the greats. What a joy to have followed such a high quality performance for so long. 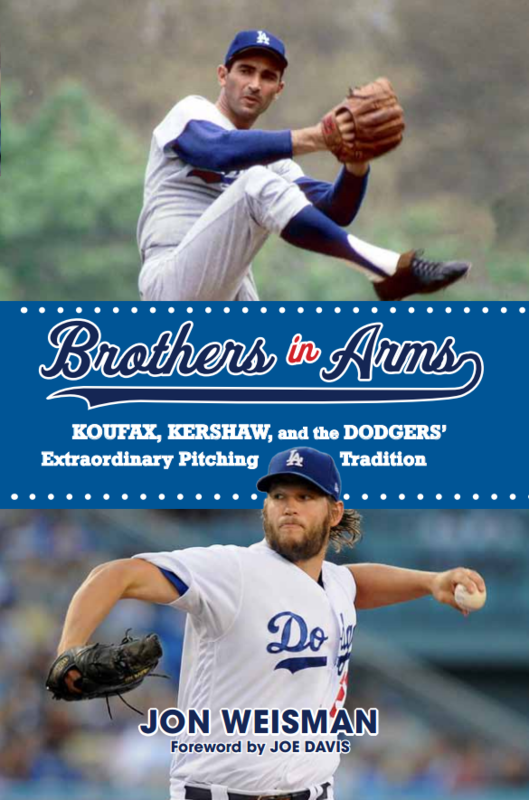 Have been enjoying the “Images of Baseball” series put out by Arcadia Publishing. Have “Brooklyn Dodgers in Cuba”, just received “Mexican American Baseball in Los Angeles”, and waiting to receive “Mexican American Baseball in the Inland Empire”.